WEAVES event is supported by CMAI, IL&FS Clusters, PDEXCIL, AEPC, SRTEPC, SIMA, FIEO, TEXPROCIL, TEA, ITF & HEPC. It aims to bring together supply chain partners and stakeholders to a common platform and conduct conference, exhibition & industry-interactive activities to strengthen the Government’s vision of achieving pre-eminent global position in terms of market share of all textiles products manufactured and exported from India. Further, it is a need of the hour to bridge the competitive gap among the clusters present due to the fragmented structure of the industry and also lack of awareness on techno-socio-economic advancement happening worldwide. WEAVES is an attempt to facilitate partnership between Indian and overseas buyers with textile manufacturers and traders of this region. Additionally, it is an effort to have a global connect for weavers and create opportunities through networking, technology, smart marketing and business empowerment. Key delegates will include industry leaders, dignitaries from Ministry of Textiles, officials from state Governments, etc. 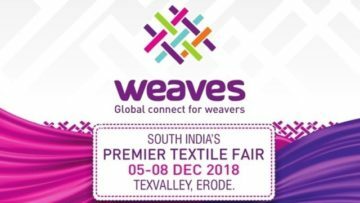 Texvalley is an integrated textile market and the first of its kind in South India, an initiative by the Government of India with the support of Tamil Nadu Government in order to help weavers in the cluster of Erode. It represents southern state’s textile activities, which have grown in terms of value, volume and variety over the decades. Texvalley houses domestic textile zone, with a complete eco-system of business ethics, compliance and certifications.